Send your list of requests to Peace Seeds, 2385 SE Thompson St., Corvallis OR 97333-1919 USA, with a check or postal money order for the appropriate amount including $3, shipping and handling. For orders outside of the USA, please include 30% of cost of order for airmail postage and handling. We can be e-mailed at alkapuler@yahoo.com. the continual hard work, perseverance and devotion of Dylana Kapuler and Mario DiBenedetto. To Dominique Guillet of Kokopelli Seeds for supporting public domain plant breeding and a better world for everyone. For a 15 minute video tour of our main greenhouse, google Kinship Garden. endeavor and its 4 decades long history. For a 2019 list send a SASE to 2385 SE Thompson St., Corvallis OR 97333 USA. To Kusra Kapuler for assembling, organizing and developing our new website PeaceSeedsLive.com. To James Lawson for PeaceSeeds.com. To Hal Brown Sr., Hal Brown Jr., Tracy and Dan Lamblin for ongoing fundamental support. David Rains Wallace, a modern Charles Darwin. To GRIN and seedfolk locally and worldwide. To Sarangamat Gurusiddian Ph.D. for collaboration in the amino acid analyses. To the Public Domain of Life that holds in trust biodiversity for everyone. To Bob Dylan, Mark Knophler, Joan Baez and The Grateful Dead. Thanks to all of you, the endeavor grows. Some of our closest lifetime friends and collaborators passed away this past year. their genius and their inspiration. To Ron McComb who helped many lives with light shows, Rolfing and transcendental experiences. importance of open pollinated seeds especially of heirloom vegetables and flowers. To Anpetu Oihankesni founder of SourcePoint Seeds in Paeonia Colorado. the best species seed company on earth. long-term health. Some of his insights and attributions are now included in the following list. microbes ie bacteria, archaea and viruses that created them. We are responsible that the seeds we supply are fertile and correctly labeled. We are glad to reimburse anyone dissatisfied to the cost of seeds and no more, or to re-supply given kinds. We are not responsible for the mis-use of the seeds or the plants that arise from them. Our seeds exceed state and federal germination requirements. We list the minimum number of seeds per packet. Frequently we pack more, depending on the harvest. Seeds from our breeding work and other staple crops are grown on our 3 acre organic garden aka Brown's Garden. A few kinds come from our home garden. The remainder are wildcrafted in the PNW. After decades of writing seed lists and catalogs, this is the sixth time using the Angiosperm Phylogeny Group System, called APG. For a good introduction see P. Spears 2006 A Tour of the Flowering Plants, Missouri Botanical Garden Press or look on-line under APG. Peter Stevens discussion of current plant taxonomy in the APG/MOBOT website is difficult, excellent and inspiring. We encourage people to do a google image search for the species and cultivars that we offer and to look into Wikipedia on-line for more information about germinations, ecology and horticulture. A widespread aquatic food plant of north America, used by natives for untold centuries and of major importance in the pacific northwest where it also feeds ducks, geese, muskrats, nutria and beavers. Plants are attractive, to 3', with large arrow-shaped leaves and spikes of 1" white flowers, male and female on the same flowering spikes, sometimes sexes on different plants. Seeds are fresh collected from the plants we grow. Sow seeds on moist flats in spring, keep moist for several months, let dry out for several months during summer and then water in the fall when they will germinate. Sam Thayer aptly says that although invisible to most the swamps that grow the turion=tuber growing Sagittarias provide the staff of life for foragers. The tubers can be dropped in a shallow water (6-20 inches deep) pond or tub with several inches of soil on the bottom. After they grow roots, they will sink to the bottom, root in and make leaves, flower and eventually seeds. Supplies are limited. One of the major PNW Amerindian food plants. The common and widely distributed species with edible bulbs and attractive purple flowers. This was one of the major food plants of this bioregion prior to the Columbian exchange (see the books 1491 and 1493 by Charles Mann for a mind opening unveiling of life in the New World before and after Columbus). At one time, the Willamette Valley in springtime was a blue-purple blaze from the coast range to the Cascades as the camas was widespread and prolific. Camas was tended with care by the native peoples who harvested it. Now it is marginalized. Burbank, 85 years ago bred cultivars with large bulbs and a variety of flower colors including pinks, blues, pale yellows, to show that this is a multifaceted taxon with delicious bulbs and beautiful flowers. The fresh bulbs are an ivory white when harvested in the fall, getting up to hen's egg in size, about the same size as wapato. Camassia is biologically close to the agaves. Both are rich in inulins, polymers of fructose. Inulins are important food for microbes in our intestines. Chicories and yacon are also rich in inulins. In 1998, Gurusiddiah and Kapuler analyzed the juice of a camas bulb and found 15/20 amino acids used in protein synthesis in the juice. The highest amounts were, in descending order, arginine, cysteine, threonine, isoleucine, aspartic acid, tyrosine, serine and histidine. In comparison with other vegetables, the camas is unusually high in some of the rarer amino acids needed by our bodies for making proteins. that they are interbreeding....hence called a grex. Perennializing hardy heirloom with bulbils made on the top of inflorescences as in some garlic and onions. Supplies limited. Hardy clump forming perennial to a foot or more tall with flat leaves that are good for many culinary purposes. Worth including in a perennial food garden for the temperate climate. About a decade ago I purchased several Clivia seeds from Silverhills Seeds in Southern Africa, grew them up to flowering and then ordered 125 seeds from which more than 80 have now flowered. The crosses were of many kinds. Since C. miniata has both orange and creamy yellow flowers, both of these were used in the crosses as were several other species Clivia caulescens, Clivia gardenii and maybe C. nobilis. These are spectacular flowers with impressive variation in flower color,, shape and cluster. It takes 3-5 years from seed to flower. Clivias prefer part to deep shade, cool non freezing weather and good, organic garden soil. Perennial with thick plumose foliage of distinctive character to 3' and rather cold tolerant, even frozen it is sometimes come up from the crown. Perennial shrub to 2 feet with sharp pointed leaf-like structures and red berries. Is known to increase circulation and is an herbal for varicose veins and hemorrhoids. South African perennial herb with starry white flowers on 4-5' spike. Good for cut flowers. The common name comes from the sound of the spikes with dry pods rubbing together (cf. Wikipedia). Will not withstand freezing conditions. Temperate vine that develops 2-3' or longer starchy edible roots, sometimes wrist sized and taking several years. On the vines, small aerial edible bulbils develop which drop to the ground and produce new plants. We supply vegetative seeds. An alternative name is Mountain Yam and this is a true yam, a dioscorea rather than a sweet potato which is a tuberous rooted morning glory with which it is frequently confused. One of our customers instructed us that these aerial seeds grow male plants. During the 1950's my father and I exhibited orchids in the International Flower Show in the NY Coliseum. In the process I made the acquaintance of G. Hermon Slade from Vanuatu, New South Wales in the south sea islands where he had an extensive orchid collection. He later sent me a plant of this Australian species that is that sole relic of my childhood collection, more than 50 years on. My father kept it alive until the mid 1990's. It is doing better now than in previous decades growing in our cool, shady greenhouse where it is kept dry during the winter to induce flowering. provides a parent for many new sweet corns that contain anti-oxidant pigments. In 1955 three acres of Golden Jubilee Sweet Corn gave me food and shelter. One of the best corns bred in the USA, we offer the open pollinated selection from the original hybrid. Plants 6-8' tall, green, cobs with yellow-orange seeds high in zea-xanthin, one of the three pigments that protect our eyes. A great sweet corn. The following tale comes from the request of Botanical Interests, a Colorado Seed Company, to relate when we first began converting the F1 hybrid Golden Jublilee Sweet Corn to open pollinated True Gold Sweet Corn. When I was about 13 years old, my parents had renovated a large chicken coop for a summer residence a couple of hours north of Brooklyn, where we lived. On the road to this place near Washingtonville NY, there was Mr Wester who grew the three acres of sweet corn that he called Golden Jubillee along with an acre of strawberries. When we stopped to get some of his delicious yellow sweet corn, I would run out into the corn patch and disappear among the rows. It was the first sense of freedom that I knew. Some decades later when I was living in Southern Oregon near the Applegate River, I became friends with an aging farmer who grew several acres of Golden Jubillee. He would give me a burlap sack to fill with ears and charge me a dollar. I began saving seeds from his corn in about 1978 growing it for at least 5 years before offering it in one of the first Peace Seeds annual lists. Since it was no longer an F1 hybrid but an open pollinated line, I had to change the name and True Gold is both true and appropriate. It remains to be one of finest sweet corns bred in the USA. True Gold was released in 1983 as far as I recall. So True Gold is at least 35 years old as an open pollinated line. Attractive and hardy water plant to 6' with panicles of small purple flowers. Seeds are similar to and feel like those of Canna indica. Perennial vine that is one of the primary herbs in traditional Chinese medicine. Seeds come from Eastern Prince cultivar which is self fertile. The seedlings revert to separate male and female plants. Apiales- close cousins of ginseng and the daisies. A hardy perennial pacific coast native species to 4' tall with white flowers and thick leaves. Hardy perennial native to coastal species to 4' with white flowers and attractive character. Hardy perennial that makes large clumps, 6-10' tall, of ferny foliage and licorice fragrant seeds. Widespread hardy umbel of cold climates. Also called Heracleum maximum. Big plants. Hardy umbel to 3'. Original seeds from Safanov in 1994. Growing in our garden for decades. Hardy European perennial herb. Strong intense aromatic flavor. Growing up larger plants is more difficult. Some species have very long primary taproots that makes transplanting difficult. Soils too are an important factor and good drainage is essential. We use a mixture of basalt scree, pebbles, sand, compost in an ongoing work dedicated to growing these rare, beautiful, and disappearing species. Well respected medicinal plant with powerful and bitter roots that come from slow growing large rooted perennials. From the Siskiyou's to the Cascades and in the Gorge, these umbels have yellow, sometimes pale yellow to purple flowers. Root juice contains asparagine and proline in significant amounts. and ate it raw. It was delicious, better than any parsnip or carrot that we have grown. Eaten as spring greens and winter roots, these small herbs are endemic to the PNW and used by generations of local native peoples for their nutrition and medicine. The seeds were carried and distributed by medicine folk and healers with stories that they were used for bacterial infections like pneumonia and tuberculosis and virus infections like influenza. Ryan Drum considers these seeds an effective and worthwhile replacement for Lomatium dissectum roots. His on-line discussion of this plant also known as the Indian Consumption Plant is most excellent. Hardy perennial to 1' with spikes of yellow flowers that bloom for months during springtime. Young leaves and roots were used for food and medicine by the west coast natives. Found from California to British Columbia. Hardy perennial European herb with tasty immature 1/2" licorice tasting fruits that become fluted conical seeds. Attractive ferny foliage. My sincere apologies for having provided these seeds during the past years under the name of Bunium bulbocastaneum, the Earth Chestnut. I received the seeds from a botanical garden in France under the name of Bunium bulbocastaneum. The plants are reported to make edible roots but mostly they are aggressive ground covers with attractive foliage. Since other members of the genus Oenanthe are toxic, it is wise to be careful in eating this plant. I have eaten small amounts of the leaves with no negative effects. By searching with Google as well as finding a comment in the 2016 Seed Savers Exchange by Greta Loeffelbein suggesting that the plant was actually Conopodium majus only recently was there a Wikipedia entry that looks to have solved the appropriate identification. By examining the photos under image for these three possibilities, only one really works which is Oenanthe pimpinelloides. I will gladly reimburse anyone who received these mis-identified seeds. Bunium bulbocastaneum is also known as black cumin as is Nigella sativa. Both seeds are used as aculinary spices. The seeds for O. pimpinelloides are not fragrant and their shape is different. grasses and can be mowed to make a green path. Excellent European Heirloom; long roots, large crowns, excellent flavor. Selected from heirloom land races collected for the USDA and adapted to our yard during a decade of acclimatization and selection. Distinctive aroma and flat, thin leaves. Another tale of adaptation, selection and weediness: it took awhile for this European species to germinate and adapt to our shady, moist, PNW valley yard. Then a few years ago some nice large green plants flourished in January to March before much else was really thriving. The next year, 1/4 of the yard was occupied by Alexander's. Turns out that the compost pile needs fresh green during the late winter and early spring. Alexander's is a prime ally for compost making, fertility enhancement and tasty spring greens for soup and salad. Established in our yard as a perennial grown from seed, now 9 years later it has provided an abundant seed crop. Plants are 5-6' tall, sprawling, attractive with clusters of small white flowers and purple berries that are considered by some to be an adaptogen. Stratify for several months at 40F under moist conditions for germination. Likes moist and shady conditions. Asteraceae- largest family of dicots, 14-16 tribes, the golden daisies of the sun. A staple of the macrobiotic and vegan diets. Long roots work their way into clay soils bringing up minerals and breaking thru hardpans. The roots can get bigger than one's wrist. They contribute a unique flavor to soups and stir fries and have nutritional/biochemical traits in common with milk thistle and globe artichoke. Free pre-protein amino acids in descending order of abundance in root juice are: glutamic+asparagine, arginine, proline, glutamine, isoleucine and phenylalanine. From a mixture of Chicories, this is a unique selection with large, broad leaves. A pacific coast wildflower originally from southern Africa. Hardy and attractive. A venerable foodplant for the edible parts of it's immature flowerbuds. Seeds were collected from winter survivors. About half the time these plants overwinter and then we get a fine harvest. Deep freezes below 20 degrees F kill the plants. From crosses of regular sunflowers with the Silverleaf Sunflower arise new combinations on stiff, long stems with fuzzy leaves. This ongoing development combining these species, improves horticultural and aesthetic traits. Towers of flowers and flower-thick spikes are in the genome. In 1997 we grew a kinship garden of the daises. With 14-16 tribes, more than 1200 genera and 25,00 species, there was a considerable opportunity to select the representatives (reps) for optimizing our view of daisy diversity. Among the genus Helianthus with 50 reps or so species endemic to the mainland USA, the GRIN network provided seeds for a dozen species and reps of H. annuus from a dozen countries. Several years later, we noticed that within our volunteer sunflowers were some new traits: longer flowering season, particularly at the end of the season, many branches and branches stiffer than usual with occasional whorled flower clusters. 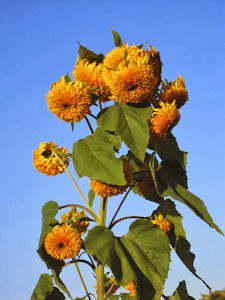 It seems that of the 4-5 species that can cross with Helianthus annuus, H. argophyllus is one of them and it was H. argophyllus that contributed the new traits. For more info about the species and the crossing of sunflowers see The Sunflower Species of the United States by C.E. Rogers, T.T. Thompson and GJ Seiler. 1982, pgs 63-66, National Sunflower Association. In 2011 we repeated the growout of Helianthus argophyllus and it crossed avidly with our wild sunflowers. The seeds we offer are from the F2-F4 generations. Some of the hybrid plants were 14-16 feet tall and kept flowering for months after the H. annuus had finished flowering. A beautiful and invaluable species for its ability to cross easily to the common sunflowers (Helianthus annuus). The plants grow 3-12' tall with soft fuzzy leaves and clusters of 3" yellow petalled flowers with dark centers. The progeny of crosses with common sunflowers (China Cat Sunflowers) can grow 15' and flower for several months longer than regular sunflowers. Birds love them. This is a rare species endemic to the Gulf Coast of southern Texas. A mix of single and double flowers. 2-4' shrubs with marvelous colors and patterns. It is our core mix that gives rise to new varieties. Towards the end of Frances Hoffman's life, I would wander through the garden and pick her a bouquet. She was a lifetime seed saver, horticulturist and plant genius so my eyes were open to the unusual and unique. By the time I had picked several dozen kinds of flowers, I walked down a 40' row of China Cat MG and saw a heretofore unseen flower, single with 8 petals, dark red-purple with a gold rim around each petal. I cut the flower and put it in her bouquet and tagged the plant. A few days later, on the phone, she expressed her appreciation for the flowers. Her only specific comment was 'that's a right beautiful single marigold'. So having tagged the plant and collected several mature, fertile, seeding flowers. I planted them the following year and got a 40' row, all with the same flower I sent to Frances. Of particular relevance here is that the seeds from the one plant, now called Frances's Choice bred true in spite of the layout wherein the one plant was in a direct seeded row of about 300 plants of a marigold mix that upon close inspection can be seen to have virtually every plant different from one another. So we found that most of the T. patula's breed true rather quickly. This is not true of Tagetes erecta which outcrosses very easily. Frances's Choice is 3-5' tall and has 8-9" long stems, ideal for picking for small, distinctive and outstanding bouquets. We consider marigolds and sunflowers the most important companion flowers in the vegetable garden. This mix returns the tall and wide marigolds to our gardens. Plants are 2-8' tall with a yearly changing mix of colors, patterns and morphs. 2-3' stocky, well branched bushes with hundreds of yellow and orange flowers that change color as the season progresses into burnt chrome, paisley and stardust. flowered from june to november and had remarkable starry eye-catching patterns. 3-5' tall plants with double flowers, a selection of Frances's Choice. Like it's parental line, it has 8-9" flower stems making it another fine choice for marigold bouquets. In Mexico and Central America where Tagetes patula is a wild flower, it and Tagetes erecta are important health promoting herbs. Sacred to the Day of the Dead, these plants are brought into houses and provide sesquiterpene fragrances that inhibit the growth of common infectious bacteria like staph, strep and pneumonia and their viruses. The bright flowers maintain well in mild frosts and last well into fall in the Willamette Valley. They light up our home for months and remind us that fragrance and color from organically grown flowers help our moods, brighten up our spirits and sustain our bodies as winter comes on. Robust plants to 3' with a profuse bloom of 2" flowers with large petaloid centers. This is the same phenomenon as seen with sunflowers where doubles cross with singles to give tiger's eyes. These are beautiful and interesting to grow in the annual garden. When the cone of a zinnia fills up with petals, a polypetalous flower is formed. When the colors are iridescent, glowing, bright and subtle, intense and eye-widening and the plants 4' tall it makes more sense to be in the garden than anywhere else. Public domain plant breeding for beauty and true living color. Herbaceous perennial from Europe with light blue petals and yellow eye. Lovely. Early. Hardy perennial with attractive leaves and flowers. Dark purple magenta leaves on 3-5' plants make good salads. A reseeding annual. Hardy perennial salad plant to 2' with leaves for steamed greens and flowering spikes for good nutritious food. We mis-identified this for several years with Hablitzia tamnoides. Thank you for your patience and to the gardener who pointed out our mistake. different cultivars provided by Barstow and Trixtrax and grown in our home organic garden. One of the most beautiful of the coastal native wildflowers. Sprawling vines grow in PNW coastal beach sand and can make colonies 10-20' across. While walking in the intertidal strand in Newport, OR, there are scattered relic populations of endemic species. Every once in a while there is a 3-5' diameter mat plant that tenaciously holds to the sand and the adjoining cliff faces. From the dense dried flower clusters it is relative of the bistort, Polygonum bistorta. Thanks to Dan Segal (Ithaca, NY) for helping with the taxonomic identification of this species. Hardy shrub to small tree with 1" spherical fruits with hard seeds and palatable sweet flesh. Another dogwood, Cornus mas, the Cornelian Cherry Dogwood seems to be somewhat confused with the Kousa Dogwood. The latter has a fruit juice appropriate for a sorbet. The former has a single large seed in a small, rather juiceless fruit. Native species with edible fruit. Grows to 4' in large stands in the coastal strand inland to the beach sand. Some plants have choice edible berries. Others are insipid. Hardy erect perennial to 8' with attractive leaves and shiny black edible berries held in clusters. This was part of the native amerindian diet as were other Vaccinium species that grow in the Cascades. Decumbent perennial herb whose roots contain anthraquinones that impart a red color to fabrics and paints. Plants have been hardy in our backyard to 20F below freezing. selenium and antioxidant vitamins, tames herpes outbreaks, is good for shingles, insomnia, headaches and hypothyroidism. Native to Europe and central Asia, this is a hardy perennial to 3' tall with classical use in herbal medicine. to the USA. The plants have ruffled purple leaves with a fine fragrance. Hardy plants to 1' with small pale blue flowers. Has been used in Chinese traditional medicine for stress, anxiety, headaches, and depression. Extracts have anti-inflammatory and anti-cancer properties (breast and pancreatic cancers) in that it induces apoptosis (programmed cell death). We thank Aline of Green Journey Seeds (Eugene, OR) for providing us seeds of this medicinal herb. A yellow flowered species appreciated by hummingbirds. Hardy perennial. 2' hardy perennial shrub with attractive purple flower spikes. Probably Plantago ovata but unusual in several aspects. The huge single plant we found had 29" flower spikes and was growing in beach sand near a fresh water rivulet. Edible leaves. Hardy attractive biennial with yellow flowers and tall inflorescences to several feet. its early years. It is distinguished by belonging to a unique temperate zone genus in a predominantly tropical family. The fruits are held in clusters and are truly delicious. A hardy perennial with a mix of attractive springtime flowers. Reseeds with vigor. There is new interest in Capsicum with the discovery of more than a dozen new species in southeastern Brazil, all with 2n=26 chromosomes while the commonly known species have 2n=24. Further, as we grow more species and their cultivars, it seems that as for example in the following list of Capsicum baccatum distinguished by cultivar as well as with variety, the different varieties could well be species. In part it will depend on interspecies fertility which can be further developed. Some C. baccatums are more cold tolerant than many of our cultivated peppers which belong to Capsicum annuum, Capsicum chinense, Capsicum frutescens. Native from southern Mexico to northern South America, the first of the 26 chromosome Capsicums (other familiar Capsicums have 24 chromosomes). Grown for years in a greenhouse, the leads reach up 12-14 feet. Plants have small yellow flowers and small round red fruits with no heat. Hardy, attractive biennial to short lived perennial with lavender, purple and white flowers. Hardy perennial with red orange edible fruits enclosed in a papery husk. Beautiful in fall. A species from the Galapagos Islands with some of largest fruits (half inch spherical fruits) of any species tomatoes we have grown. Since it is know to cross with S. pimpinellifolium, this is maybe one of the species that has given rise to our large salad cultivars. that gave rise to the centiflors ie hypertress tomatoes. In the recent revision of the taxonomy of the genus Solanum (see solgenomics and SolanumSource.org), the tomato clade of about 17 species has once again been reincorporated into the huge genius Solanum (ca 1600 species). In addition, the derived, cultivar level tomatoes with which we are all familiar are included in a new species called Solanum lycopersicum replacing the familiar species S. esculentum. This group of plants is an interesting place for gardeners to learn about species and how they were/are the foundation of modern cultivated varieties. The seeds of modern edible tomatoes are 2-10x larger than those of the species. Plant architecture is different among the species and flavor of the small wild fruits has distinction lost in many modern cultivars. The solids in the juices of tomato fruits are mostly amino acids used to build proteins. The ones in the highest amount are glutamic acid, glutamine, aspartic acid, asparagine, gamma-amino-butyric acid (GABA), serine and alanine. We still do not know how the current tomato cultivars arose from the wild species. A note about Centiflor Tomatoes that occasionally outbreed. In the following list of tomatoes are several that flower with hypertresses. By this we mean that when they flower they have clusters of flowers and then clusters of fruits. Some like Golden Tressette have 20-40 flowers on a tress. Others like Red Centiflor, Yellow Centiflor and Orange Centiflor can have more that 100 flowers on a tress and hence we coined the term centiflor for this phenomenon. In addition, both Geranium Kiss and Full Moon Kiss have hypertresses with 20-50 or more fruits on an inflorescence. During the decades that we have been growing tomatoes, saving their seeds and replanting them we have not found any crosses. That is until the centiflors. Occasionally the hypertress phenomenon arises in other cultivars that have bred true for a long time. Hence Dylana Kapuler has observed hypertresses in Peacevine Cherry and Palestinian heirloom. The hypertress trait arose from a cross of a cherry tomato with an Andean species. It was completely unexpected. In order to adapt to changes in environmental conditions crosses between individuals and species (ie outbreeders) are a fundamental part of the process of evolution. As a society and gardening culture that favors tomatoes we have been growing and seeding inbreeders ie self fertile cultivars and they do not mix genetically with one another. Thus we have not been developing cultivars that are locally adapted. Only by outcrossing and especially outcrossing by local insect pollinators do we move back into the rapid and essential adaptation of tomatoes into our own gardens with their unique ecologies and that face the extreme environmental changes that are now happening. Further discussion of Occasionally Outbreeding Tomatoes can be found on Mushroomsblog.blogspot.com. Determinate stocky Hawaiian cultivar from Glenn Teves. Red fruits to 1/2 pound. Excellent. Heirloom from Arche Noah, Austria EU with pale yellow small cherry fruits of good flavor and long standing productivity. Late blight resistance. Original breeding by Graham Jenkins-Belohorska (UK) using Red Centiflor HT Cherry Vine Tomato as one of the parents. Vigorous indeterminate vines with purple blush on red fruits. Quite late blight resistant. Small hypertresses. new cultivar has both Solanum pimpinellifolium and Solanum chilense in its ancestry. Tresses of 20-30 flowers yield clusters of 1/2 inch orange tasty fruits. Our original seed stock came from Rosemarie LaCherez. This was one of the parents of the centiflor hypertress tomatoes. A cultivar arising from Geranium Kiss Tomato with yellow fruits of excellent flavor. From Glenn Teves, stocky determinate cultivar with quarter to half pound red fruits. Unusual indeterminate vine with long-standing thick-skinned fruits shaped like large red jelly beans. Good flavor and worth growing. Original seeds from Glenn Teves, Hawaii. Does not make many seeds. Indeterminate red, tart, productive 1/2" fruits from Andrey Baranovsky, Belarus. Selected from a well known hybrid since the early '70s, this vigorous indeterminate vine with two ranked flower spikes of a dozen flowers makes many very tasty 3/4" red fruits. In a university study of 30+ varieties of cherry tomatoes for Vitamin C content, this was #1. The fruit juice also contains 17 of the 20 amino acids used to make proteins with significant amounts of the neuromodulator GABA (gamma-amino-butyric acid). From German seedsman Jacob Wenz, a medium sized indeterminate red fruited mid season cultivar. Original seeds from Jacob Wenz of Germany give rise to very sweet and delicious early red cherry tomato fruits. Indeterminate. Arche Noah (Austria EU) heirloom with tasty small red fruits in clusters on indeterminate vines. Late blight resistance. breeding of nutritionally and architecturally unique new cultivars. Red pear-shaped fruits on flowers carried above the foliage. These plants make hundreds of flowers and carry abundant fruits on vigorous plants. One of the unusual characteristics of the Centiflor tomatoes is that, unlike most garden tomatoes, they outcross occasionally. This creates problems in seed saving but opportunity for crosses that the bees can do. This new variety arose from a cross of Sungold with Red Centiflor. These are vigorous hypertress vines with remarkably delicious fruits. Derived from the same cross detailed in the previous listing, this line makes somewhat larger fruit, with a distinctive point on the end of the round bright fruits. While both parent species leading to this cultivar has 5-20 flowers in a spike, these centiflors (meaning 100 flowers) have hypertresses of flowers leading to a unique and distinguishing aspect. Named for a Canadian town in British Columbia. Plants are stocky, to 3' with red, half pound rather hard fruits. Original seed for this heirloom from Chuck and Penny Hayes of Kamloops, BC. Shrubby plants to 2' with many tasty, red pear shaped fruits. One of the first cultivars derived from wild species. Strong indeterminate vine with bright yellow flowers in clusters. This is a hypertress species. In one hypertress of 84 flowers, all set fruits. Considered to be difficult to cross to the common tomatoes, successes, if any, come from using it's pollen to make crosses. Fruits are green with purple shading. Fruits are edible not choice. Small red fruits in bichalazal racemes reminiscent of Sweet 100 or Peacevine Cherry. But the fruits are much smaller. The plants ramble extensively. Tasty fruits with intense flavor. Hardy biennial with nice aspect and tasty leaves similar to water cress for salad in cold weather. Hardy biennial salad plant with the largest rootstocks of any kale we have seen. From a single plant among many Russian Red Kale was the progenitor of this new line. Leaves are ruffled, complexly shaggy, soft and of excellent edibility. A dependable heirloom for winter greens; to 4', vigorous plants with leaves salad and steamed greens in fall, winter, spring and summer. The top 5 free amino acids for protein synthesis in the leaf juice are in decreasing amounts: aspartic acid, glutamic acid, serine, alanine and threonine. From a cross of Green Wave and Osaka Purple, this is an attractive combination. To 3' or more, large leaves purple on top side, hardy, somewhat hot flavor, very vigorous. Open pollinated, large primary heads and good side-growth after primary harvest, to 2'. Vigorous and nutritious with significant amounts of glutamine and other free protein synthesis and energy amino acids in the stems and buds. Top florets have the most free amino acids compared with the stalk and stem that holds them. >>alanine, glutamine, glutamic acid, proline, GABA, serine and valine. Hardy and weedy perennial to 3" with fragrant flowers loved by bees. Native to the PNW coastal beaches, hardy biennial to perennial with succulent edible leaves. Grows in beach sand at the edge above the intertidal zone and below the coastal tree zone of the shore pines and sitka spruce. Sustainer of the world's soil fertility as homes for rhizobial microbes and as green manure and cover crops. The legumes and roses have different species of bacteria that fix nitrogen in their roots yet the flowers are very different. Thus Linnaeus supported a misconception about plant relationships that took more than 200 years to correct. to the seeds that we offer. So far it is difficult to identify among the 3000 astragalus species. Perennial nitrogen-fixing living 3-10 years, growing 6-10' bushy plants that are a sustainable food plant of tropical ecosystems. Growing and overwintering in our greenhouse, they began making flowers, pods and seeds the second year. Now, some years later we prune them down to 3-4' and they regrow in the following season… A primary food plant in zone 10 and warmer places, used for dahl and tempeh. A west coast native that was one of the parents in the Russell Lupin hybrids found in many gardens. Beautiful large wheel shaped leaves with up to 16 leaflets. Spikes are up 5' and flowers are pink to tan. Collected in the Willamette Valley where only relic populations remain. We first identified this annual/biennial species growing on the banks of the Applegate River in southern Oregon. This year it volunteered in our backyard garden and we are glad to offer this plant that grows to 6' with a fine vanilla-like fragrance. Distinctly patterned seeds on tall medium-late vines with excellent 6" snap pods combine with it's history to make this worth growing. A few years after we became members of the SSE (the Seed Saver's Exchange), we received a package in the mail from a Mr. Pritchard with a note saying that the enclosed seeds would be of interest to us. He said they were a third generation from seeds found buried in a cave in a clay pot, sealed with pine pitch and C-14 dated to 1500 years ago. Interestingly, some 15 years later, one of my customers related that her daughter in a UCLA anthropology course digging for pygmy elephants in New Mexico found a clay pot with the beans and had them carbon dated. No one has related about their initial germination and growth, both of which are considered unlikely in modern scientific terms. We have grown them for decades and seeds are unlike any other. Several people have selected lines of this bean whose markings are characteristic and distinguishable from one another. The snap pods of peas and beans are some of the richest sources for free amino acids in our diets. The analysis of the juice from a fresh snap bean of this traditional and other heirloom cultivars shows large amounts of the following free pre-protein amino acids >>glutamine, alanine, glutamic acid, valine, threonine, methionine, leucine, cysteine and lysine. 8' vines make 5-8" snow peas in abundance, bicolor purple flowers, green pods, a choice cultivar with large delicious oriental style pods. A Peace Seedlings favorite. Prolific hypertendril vines exceed 8-10' with green snap pods some having a purple stripe and bicolor purple flowers. Unique and tasty 3" snap pods on 5-6' vines with white flowers and remarkably sweet leaves that surround the stems of the vines. The first yellow podded snap cultivar. Has been longstanding and productive in tropical ecologies. Named to commemorate the struggle to preserve our old growth forests. Vigorous vines to 8-10' with bicolor purple flowers and green snap pods, most with a pink blush. This is a hypertendril cultivar. Vigorous vines with purple flowers and purple 3-4" snap pods of fine flavor. We have two seed batches for this purple snap vine cultivar. We will pack the hypertendril cultivar first and then when it runs out, we will use a seed stock that has a mixture of tendril types: regular, hypertendril and vetch (no tendrils) and parsley. Unexpectedly, the cross of a Parsley Bush Pea with a Purple Podded Snap Vine Pea generated the hypertendril trait. Hypertendrils are very distinctive, they hold a population of peas together, a useful self-supporting characteristic. An excellent tall growing vine with 4" green snap pods, 2 flowers/node, white flowers. A public domain cultivar in a heavily PVPed group of plants. A hardy western species with trifoliate leaves and bright yellow flowers on 3-4' spikes. We have observed only scattered patches of this attractive species in west-central Oregon. One day some years ago, Ianto Evans returned from Guatemala with a bag of fava beans part of which he shared with us. While collecting the tan seeds from one of the plants, one of the pods had several bright yellow seeds. The next season they were planted and bred true. Some years later, there was an article about Israeli researchers who found elevated levels of dopamine in the seeds and suggested that they would be useful food for folks suffering from Alzheimer's disease. Years ago in our early days of seed growing and collecting, we received some large tan fava beans from Peru with a distinctive red-purple blotch on the flat surfaces of the seeds. Western native coastal species of shrub to small tree with male and female plants. Grows in moist sand and has nitrogen fixing root nodules. plants with blue, white and magenta flowers. Small tree whose fruits and bark have been used medicinally, especially for constipation. orange fruits and then sometime later to our delight we noticed that a plant of this SW China species had volunteered in our backyard. An heirloom cultivar with green fruits when mature. A unique and delicious flavor. Seeds from a single volunteer plum tree in our yard that likely arose from a Burbank Satsuma crossed with a purple leaved Prunus pissardii. The medium sized fruits are delicious and mature in late october to mid november making it the latest plum cultivar of the half dozen that thrive under our conditions. Rooted cuttings from this tree are now available from One Green World. We bought a plum tree from a local nursery, supposedly a Brooks, one of the largest and well known varieties for making prunes. After a few years we got some plums. They were teardrop shaped, exceedingly delicious and quite small. We dried a few and they made superb dried plums. So we traced them down to a remarkable history. In the 12th century, returning from the Crusades and ancient city of Damascus (modern day Syria), monks collected seeds of the Damask (or Damson) plum which originated in the Caucasus Mountains between the Black an Caspian Seas. The monks planted the seeds in a monastery in the southwest of France about 35 miles from the town of Agen. These trees crossed to a wild, local plum and gave rise to a legendary heirloom that we inadvertently acquired. A member of the genus of horse chestnuts, this is a native of the lower great plains states into Texas. Frances Hoffman gave us a flat with seeds more than 20 years ago. This is the third seed crop. The trees grow under a large black walnut. Not edible. Paeonia lutea v. ludlowii and native to parts of Tibet. Six papers with HPLC Analysis of many leaf, root, fruit and flower juices, the Hoxsey tonic, garbanzo bean miso, broccoli-an inch at a time from stem to buds, onion-one bulb leaf at a time from the outside in. This work is done to explore amino acid nutrition. It provides meaningful and specific data about the essential small molecule precursors of proteins. Done over a period of 10 years, the head of the Bioanalytical Laboratory of Washington State University at Pullman WA did the high pressure liquid chromatographic (HPLC) analyses of juices provided by us. The results show that pods making high protein seeds are the best source of free amino acids for protein synthesis. Thus peas, as snaps and snows, beans as snaps, okra as immature pods are the most productive free amino acid sources for the cuisine of the gardener. We eat proteins to break them down to amino acids with which we build our own proteins. Nuts, seeds of many kinds, proteins in leaves and other living creatures continue to be important protein sources. Looking to make a balanced amino acid food system encourages non-violence (ahimsa) at the core of our humanimal food system. Similarly, using amino acids as criteria for selection of cultivars moves us towards a broad range of physiologically important criteria for improving our health, longevity and ability to withstand the stresses of our current society. For an article about our endeavors see 'Ecological Sanity in an Era of Corporate Monoculture' by Genevieve Weber in the corvallisadvocate.com August-September 2012 pgs.8-10. A recent article about Peace Seedlings and Andean Roots by Genevieve Weber in corvallisadvocate.com December 20-27 2012, has some great photos and text pgs. and front cover. To James Duke PhD, botanist, herbalist, plantsman extraordinare, research scientist, conservationist and talented musician. Dr. Duke has assembled a remarkable database concerning the biochemical, nutritional and discerning aspects of many thousands of plants. We find his popular books The Green Pharmacy Guide to Healing Foods and Dr. Duke's Essential Herbs essential to those of us who prefer whole plant medicine to synthetic pharmaceuticals. For a 2017 list send a SASE to 2385 SE Thompson St., Corvallis OR 97333 USA. To PeaceSeedlings for public domain breeding breakthoughs and success with Andean roots. To Alex Curnew aka GAlexC for his ongoing help. To GRIN, Alan Bishop, seedfolk locally and worldwide. To Dominique Guillet (Kokopelli Seeds) for his courage, dedication and commitment to public domain seeds, a healthy world and a loving planetary society. To Bob Dylan, Joan Baez and The Grateful Dead. We are responsible that the seeds we supply are fertile and correctly labeled. We are glad to reimburse anyone dissatisfied to the seeds and no more, or to re-supply given kinds. We are not responsible for the mis-use of the seeds or the plants that arise from them. Our seeds exceed state and federal germination requirements. We list the minimum number of seeds per packet. Frequently we pack more, depending on the harvest. Seeds from our breeding work and other staple crops are grown on our 3 acre Peace Seeds and Peace Seedlings garden aka Brown's Garden. A few kinds come from our home garden. The remainder are collected in the PNW. After decades of writing seed lists and catalogs, this is the forth time using the Angiosperm Phylogeny Group 3 System, called APG3. For a good introduction see P. Spears 2006 A Tour of the Flowering Plants, Missouri Botanical Garden Press or look on-line under APG3. Peter Stevens discussion of current plant taxonomy in the APG3/MOBOT website is difficult, excellent and inspiring. We encourage people to do a google image search for the species and cultivars that we offer and to look into Wikipedia on-line for more information about germinations, ecology and horticulture. Long white shanks, 1-3" thick, hardy, overwinters well, heirloom. An open pollinated selection from an F1 hybrid with excellent biological and agronomic traits; tight wrapped single spherical bulbs, longterm storage, crisp medium hot flavor, selected under organic conditions. An amino acid analysis of the juice of one of the early generations of this new cultivar showed significant amounts of arginine, glutamine, serine and leucine. A hardy perennializing food plant that gives "green onions" most of the year. The leaves are blue-green, stout and growth is robust. 8-10 large easy peeling cloves per rosette; hard stalk/rocambole cultivar. Bulbils will give rosettes in a single season under fertile conditions. Hardy clump forming temperate perennial to a foot or more tall with flat leaves that are good for many culinary purposes. About a decade ago I purchased several Clivia seeds from Silverhills Seeds in Southern Africa, grew them up to flowering and then ordered 125 seeds from which more than 80 have now flowered. The crosses were of many kinds. Since C. miniata has both orange and creamy yellow flowers, both of these were used in the crosses as were several other species Clivia caulescens, Clivia gardenii and maybe C. nobilis. These are spectacular flowers with impressive variation in flower color,, shape and cluster. It takes 3-5 years from seed to flower. Clivias prefer part to deep shade, cool non freezing weather and good, unamended garden soil. Hardy to zone 6-7, a pink flowering perennial bulb with clusters of flowers and sometimes huge bulbs. A hybrid of Crinum moorei and C. bulbispermum, both South African species. The flowers are fragrant. Plant with 1/3 of bulb above the ground. Please include $5 for shipping. 3 bulbs available. An unusual relative of Hippeastrums, Amaryllis, Crinums, this perennial bulb has a 180 degree twist in the inflorescence so that the tubular orange and greenish flowers face down. Grown in our greenhouse. Plant so that the top 1/4 of the bulb is above the soil level. South African bulb with spike of orange clustered flowers in late spring before the leaves emerge. Attractive and interesting. We grow these in the ground in our greenhouse in mixed sand, clay and gravel with most of the bulbs above the soil. Perennial shrub to 2 feet with sharp pointed leaf-like structures and red berries. Is known to increase circulation and an herbal for varicose veins and hemorrhoids. Temperate vine that develops 2-3' or longer starchy edible roots, sometimes wrist sized and taking several years. On the vines, small aerial edible bulbils develop which drop to the ground and produce new plants. We supply vegetative seeds. An alternative name is Mountain Yam and this is a true yam, a dioscorea rather than a sweet potato which is a tuberous rooted morning glory with which it is frequently confused. One of our customers instructed us that these aerial seeds grow male plants. Female plants develop entirely different kind of seeds. During the 1950's my father and I exhibited orchids in the International Flower Show in the NY Coliseum. In the process I made the acquaintance of G. Hermon Slade from Vanutau, New South Wales in the south sea islands where he had an extensive orchid collection. He later sent me a plant of this Australian species that is that sole relic of my childhood collection, more than 50 years on. My father kept it alive until the mid 1990's. It is doing better now than in previous decades growing in our cool, shady greenhouse where it is kept dry during the winter to induce flowering. A favorite and delicious food in Asia, we grow these in water tubs and fish tanks in our greenhouse in several inches of fertile sandy mud submerged in 1-2 feet of water. Intense purple seeds from anthocyanin pigments similar to the ones found in blueberries. Excellent fresh and makes an extraordinary corn bread both in taste and color. Plants 5-7', 1-2 ears/stalk. Dark purple stalks and leaves. This is the best selection since we began working with high anthocyanin sweet corns more than 15 years ago. In 1955 three acres of Golden Jubilee Sweet Corn gave me food and shelter. One of the best corns bred in the USA, we offer the open pollinated selection from the original hybrid. Plants 6-8' tall, green, cobs with yellow-orange seeds high in zea-xanthin, one of the three pigments that protect our eyes from bleaching. A great sweet corn. Our first sweet corn breeding project in the late 1970's with white seeded peruvian chokelo starch corn, southwest native Amerindian starch corns and several predominantly heirloom sweet (su) corns, Inadvertently, with the help of underground rodents and persistence, we got some multicolored starch corn with large flat seeds. The year after, we found a few multicolored crinkle seeds in the large mostly starch filled ears. Peace Seedlings has grown up some fresh seeds that we are please to offer. 8' green plants. 2 ears/plant. A spice seed and herb from antiquity and a characteristic of many cuisines. Reseeding annual. A hardy spectacular species with 6' tall flower spikes and clusters of bright yellow flowers. From South Siberia almost 20 years ago, now grown up into plants 3-4' across leaves and a giant inflorescence of 8-10' tall whose central umbel of tiny white flowers is more that 14" across. Monocarpic with perennial character. Eaten as spring greens and winter roots, these small herbs are endemic to the PNW and used by generations of local native peoples for their nutrition and sustenance. The seeds were carried and distributed by medicine folk and healers with stories that they were used for bacterial infections like pneumonia and tuberculosis and virus infections like influenza. Ryan Drum considers these seeds an effective and worthwhile replacement for Lomatium dissectum roots. His on-line discussion of this plant also known as the Indian Consumption Plant is most excellent. My sincere apologies for having provided these seeds during the past years under the name of Bunium bulbocastaneum, the Earth Chestnut. I received the seeds from a botanical garden in France under the name of Bunium bulbocastaneum. The plants are reported to make edible roots but mostly they are aggressive ground covers with attractive foliage. Since other members of the genus Oenanthe are toxic, it is wise to be careful in eating this plant. I have eaten small amounts of the leaves with no negative effects. By searching with Google as well as finding a comment in the 2016 Seed Savers Exchange by Greta Loeffelbein suggesting that the plant was actually Conopodium majus only recently was there a Wikipedia entry that looks to have solved the appropriate identification. By examining the photos under image for these three possibilities, only one really works which is Oenanthe pimpinelloides. I will gladly reimburse anyone who received these mis-identified seeds. Bunium bulbocastaneum is also known as black cumin as is Nigella sativa. Both seeds are used as a culinary spices. The seeds for O. pimpinelloides are not fragrant and their shape is different. Pastinaca sativa Hollow Crown Parsnip 50/3.50 Excellent European Heirloom; long roots, large crowns, excellent flavor. overcome wintertime infections and candida. A staple of the macrobiotic and vegan diets. Long roots work their way into clay soils bringing up minerals and breaking thru hardpans. The roots can get bigger than one's wrist. They contribute a unique flavor to soups and stir fries and have nutritional/biochemical traits in common with milk thistle and globe artichoke. Free pre-protein amino acids in descending order of abundance in root juice are: glutamic+asaparagine, arginine, proline, glutamine, isoleucine and phenylalanine. Our ongoing annual selection from volunteers and plantings after decades of public domain sunflowers breeding including polyheaded and large single heads, early and late flowering single, double, and tiger's eye petal morphs, color variety including bronze, amber, red, gloriosa, yellow, and lemon. Crosses with Helianthus argophullus, the Silverleaf Sunflower, a rare Texas endemic have given some late giants, stiff multi flowered spikes and a longer flowering season. From crosses of regular sunflowers with the Silverleaf Sunflower arise new combinations on stiff, long stems with fuzzy leaves. This ongoing development combining these species, improves horticultural and aesthetic traits. Towers of flowers and flower- thick spikes are in the genome. From a single wild collected flower, we are selecting a beautiful polypetalous line with 3-4" thick flowers on 5-7' plants. Late planting tolerate light frosts. Towards the end of Frances Hoffman's life, I would wander through the garden and pick her a bouquet. She was a lifetime seed saver, horticulturist and plant genius so my eyes were open to the unusual and unique. By the time I had picked several dozen kinds of flowers, I walked down a 40' row of China Cat MG and saw a heretofore unseen flower, single with 8 petals, dark red-purple with a gold rim around each petal. I cut the flower and put it in her bouquet and tagged the plant. A few days later, on the phone, she expressed her appreciation for the flowers. Her only specific comment was 'that's a right beautiful single marigold'. So having tagged the plant and collected several mature, fertile, seeding flowers. I planted them the following year and got a 40' row, all with the same flower I sent to Frances. Of particular relevance here is that the seeds from the one plant, now called Frances's Choice bred true in spite of the layout wherein the one plant was in a direct seeded row of about 300 plants of a marigold mix that upon close inspection can be seen to have virtually every plant different from one and another. So we found that most of the T. patula's breed true rather quickly. This is not true of Tagetes erecta which outcrosses very easily. Frances's Choice is 3-5' tall and has 8-9" long stems, ideal for picking for small, distinctive and outstanding bouquets. 2-3' closely branched shrubs with flowers that change color and pattern during the season making floriforous and attractive hedges along pathways in the garden. In the cool weather of the spring -summer the flowers are all wine-burgundy purple. As the days and nights become warmer, the flowers develop golden orange sectors giving a pinwheel-like appearance. Then the cooler weather of fall comes on, the young flowers become all burgundy once again. The Metamorphs or Face Changers were a race of people created by Robert Silverberg. Hardy perennial herb to 3' with clusters of white flowers having yellow centers and an aromatic fragrance useful in medicinal teas. A new mix developed by Peace Seedlings with many colors and morphologies on 3-5' plants. Large attractive flowers with some new ones peeking through. A Peruvian woman walked into our greenhouse one day and remarked 'kiwicha' upon seeing the mature cut plants that reminded her of an heirloom grain that she grew up with. Our seed came from Frances Hoffman whose plants in Nampa, ID grew 5' tall and 6' across with tall columnar drooping flower spikes that reminded her of elephants in her garden. Her seed came from Germany in the 1880's. Curiously, Peru and Germany had political connections during that era. In Oregon's Willamette Valley, plants are considerably smaller, 3-4' and seed production is enhanced by letting plants fully age. Beautiful, striking plants. Once a year, in Jacksonville Oregon, in the 1970s, Mr. Hartman would fill a glass vase with two pounds of tiny, shiny black seeds and give $100 to the person whose guess of the number of seeds was the closest. I sent some seed to a friend who had an electrobalance to determine that a single seed weighed 0.6mg but it did no good, I never won but ended up with seeds of a vigorous cultivar that gets to 10' with large, dark purple paniculate inflorescences with excellent production of seeds. A interbreeding mix of three distinctive cultivars, Crosby Egyptian Purple Heirloom, Lutz Overwintering Heirloom and Yellow Intermediate Mangel Heirloom. Sea level cultivar from Chile with white seeds, 3-4' plants and fair seed production. Bitter saponins can be washed from the seeds with warm water. Hardy perennial salad plant, unusual and making long running leads with edible leaves. Thanks to Stephen Barstow and Trixtrax for our initial seed supplies. See Barstow's book Around the World in 80 Plants if you like edibles and biodiverse adventure. Summer annual with succulent edible leaves and stems used for salads, steamed greens and stir-fried dishes. Usually grows low to the ground and is a useful garden volunteer. From the roots of this hardy biennial/perennial comes a sedative and stress reducing extract. Has a characteristic and unique fragrance in both flowers and roots. Hardy mat-forming perennial along the sandy coastal strand of the PNW, Uncommon and disappearing. Attractive leaves and red berries. Native species with edible fruit. Grows to 4' in large stands in the coastal strand inland to the beach sand. Traditional feline euphoric; seems to be cat specific. Hardy plants to 5'. Hardy perennial tea and medicinal mint that thrives in part shade, to 3'. Annual in the temperate zone with soft, velvety leaves whose fragrance and medicinal qualities have been revered in India for millennia. A venerable teaherb. Hardy perennial from 1-2 feet tall with the characteristic fragrance used in soaps, candles and herbal teas. The dried flower tops are used to protect clothing from moths. Hardy aquatic species with spring flowering attractive bright yellow flowers. A Turkish heirloom adapted to cooler nights and clay soils that grows to 3" and routinely produces 30-50 fruits per plant, 6-8" long, of mixed hotness. We eat fresh at most meals from summer through fall. Small 1' bushes, highly branched with remarkable production of 2-3" fruits that mature orange; hot, good for soups. Small 1-2' bushes with unusual bell shaped, trilobed fruits. These are hot and dry to a bright red color, suggesting high levels of the tomato antioxidant lycopene. This Chili Manzano is sweet except for the central membranes that hold the seeds which is quite hot. These are sprawling bushes with purple flowers and 2.5x1.5" fruits with thick flesh. The largest fruits are 15-20 grams. By planting 1 year old plants in the floor of our greenhouse, in part shade, next to a trellis that holds a Giant Groundcherry, the plants are now 8-10 feet tall and ramble like the ground cherry. Single plants yield hundreds of fruits beginning in June and have perennialized. Seeds are black and plants have light green velvety leaves. Ecologically distinct from the peppers we ordinarily grow in our gardens. Hardy perennial with red orange fruits enclosed in a papery husk. Beautiful in fall. Rambling 3-5' understory plants treated as 7 month annuals in the temperate zone. 1" spherical berries are orange when ripe with an aromatic, fragrant and delicious flavor. Gabriel Howearth picked up some fruits in Guatemala in the late '60s, passed them on to us and we have been maintaining it ever since. 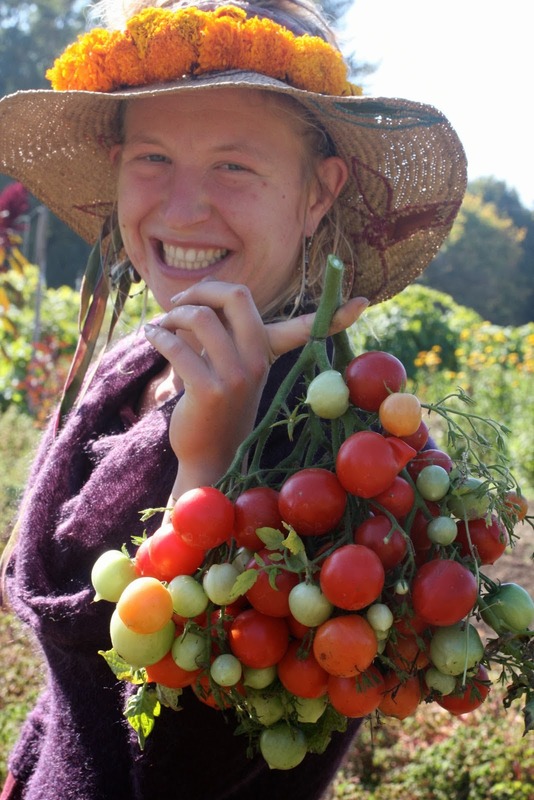 Start seeds in Jan-Mar for good outdoor crops. One plant in our main greenhouse grows over and around an 8 foot trellis. It has been thriving for more than 15 years and has a large caudex. There are small amounts of free aminos in the fruit juice>>alanine, glutamic acid, proline, aspartic acid and serine. Renamed from Solanum=Lycopersicon hirsutum, this vigorous, ground covering rambler has bright yellow flowers. Plants have small hypertresses of flowers. Annual species from the Peruvian Andes. Has velvety leaves, bright yellow flowers and small edible but not particularly tasty fruits. Attractive plants. The hypertress trait arose from a cross of a cherry tomato with an Andean species. It was completely unexpected. In order to adapt to changes in environmental conditions crosses between individuals and species (ie outbreeders) are a fundamental part of the process of evolution. As a society and gardening culture that favors tomatoes we have been growing and seeding inbreeders ie self fertile cultivars and do not mix genetically with one another. Thus we have not been developing cultivars that are locally adapted. Only by outcrossing and especially outcrossing by local insect pollinators do we move back into the rapid and essential adaptation of tomatoes into our own gardens with their unique ecologies and that face the extreme environmental changes that are now happening. Determinate bushes with 3 flowerings and fruit sets. Fruits in clusters of 4-10 red fruits 0.5-2 ounces each, similar in earliness to Stupice. Good late blight resistance. S. pimpinellifolium, the Currant tomato and Black Centiflor. A pink tomato with a long acuminate tip, quite unusual and unique in the tomato fruits we have seen during the past decades, of excellent flavor and a gift from Peter Zukis of Talent Oregon. Mr. Zukis, an accomplished gardener, got the seeds from an east coast buddy whose girlfriend's grandfather was a market and produce gardener in New Haven Connecticut during the 1920s. Joe Pesch brought it from Italy some time previous. From our cross of L. humboldtii, the Grape Tress Tomato with L. hirsutum arose this unanticipated cultivar with clusters of dozens to hundreds of flowers held above the foliage where the silky hairs of the flower buds resemble insects followed by clusters of large numbers of 1" red sweet fruits that resist cracking and rot. An interbreeding mix of six cultivars chosen for edible leaves and quality roots that is adapting to our local gardens, an ongoing eco-adaptive development. Growing to 12', a European heirloom with thick stems that twist and turn as the plant grows seeking support and when dried making distinctive canes. One of the choice temperate zone salad greens, particularly in fall, winter and spring where it's unique spicy and pungent flavor improves salads and tickles the palate. Free amino acids in leaf juices are >>proline, glutamine, glutamic acid, serine, GABA, alanine, valine and isoleucine. Our favorite for decades. We stopped growing it for awhile and when we got some fresh seeds it was crossed to a pickling cuke. Took about 6 years to return it to a sweet fruited line. Selected from a mideast beit-alpha F1 hybrid. Fruits 4-5", thin skinned, excellent. One of the Andean vegetables considered a lost crop but for many of us this is a new garden plant. Vines are prolific, thriving in our cool wet fall weather where a myriad of 1-2" green cucurbitaceous edible, crunchy, nice fruits are produced. Another rare food plant from the Andes with many virtues. Vines grow prodigiously, especially in the late summer and fall producing smooth skinned, hollow fruits that are 6-9" long and are stuffed and cooked like capsicum peppers with which they have taste similarities. The smaller, immature fruits are crunchy, tasty and carried on interesting flower spikes with one basal female flower that bears fruits and myriad male flowers higher up on the inflorescence. Fruits have unusual nutritional properties that include reducing cholesterol, countering diabetes, reducing inflammation (comparable to ibuprofen), stimulating weight loss and reducing cellulite. One of the few cucurbits whose leaves are eaten raw as a salad plant. 20" large vigorous plants with flat green 7-8" pods with fine flavor and productivity. Original public domain breeding Robert Lobitz. Productive snap bean cultivar with 6" pods and distinctive blue-grey seeds. Named in honor of Stephen Biko who was murdered in 1977 for opposing racial discrimination in South Africa. Vigorous vines, 6-8" green round pods held in clusters, excellent flavor. One of Robert Lobitz's original public domain cultivars. 16-20" plants have 5" red snap pods of good flavor and distinctive appearance. This cultivar produces edible pods early and in abundance. 5-6 large seeds per pod on 3' plants; plants can make nodules on their roots the size of a dime, Here they overwinter well when small and before flowering. Then they make food early in the season like peas. The plants flower a month earlier than Iant's Yellow. Years ago in our early days of seed growing and collecting, we received some large tan fava beans from Peru with a distinctive red-purple blotch on the flat surfaces of the seeds. Recently Joe Simcox provided us with fresh seeds having this distinguishing characteristic and we have grown a fresh crop that we now offer. An attractive, hardy and perennial herb that is native to Europe. Seeds came to us from Frances Hoffman twenty years ago and plants have inhabited our home garden since then. Hardy and attractive red flowered shrub to 3'. Also called Zauschneria. otherwise has exclusively yellow flowered plants. We bought a plum tree from a local nursery, supposedly a Brooks, one of the largest and well known varieties for making prunes. After a few years we got some plums. They were teardrop shaped, exceedingly delicious and quite small. We dried a few and they made superb dried plums. So we traced them down to a remarkable history. In the 12th century, returning from the Crusades and ancient city of Damascus (modern day Syria), monks collected seeds of the Damask (or Damson) plum which originated in the Caucasus Mountains between the Black an Caspian Seas. The monks planted the seeds in a monastery in the southwest of France about 35 miles from the town of Agen. These trees crossed to a wild, local plum and gave rise to a legendary heirloom that we inadvertently acquired. The 80,000 acres of these plums in three counties in California provide the major part of the world supply of commercial dried plums. A member of the genus of horse chestnuts, this is a native of the lower great plains states into Texas. Frances Hoffman gave us a flat with seeds more than 20 years ago. This is the second seed crop. The trees grow under a large black walnut. Not edible. In the 1970's, Peace Seeds began purchasing F1 hybrid seeds of tomatoes, growing them out, saving the seeds and repeating the process for more than a decade. In this way Peacevine Cherry Tomato arose from the F1 Sweet 100 Cherry Tomato. This technique is now called 'dehybridizing'. One must reckon that most diploids are hybrids. Tomatoes are generally diploids. People are diploids. Hence all people are hybrids. And what is called 'dehybridizing' is genetic, generational selection. If one wants all the plants and their fruits to be the same, ie. homozygous, then it may take many years to achieve. If you go into a place where wild, native species still exist you can still find bean species. For thousands of years people have been doing this, putting the seeds in their pockets, bringing them back to their communities and planting them for years to come. When we go to native peoples and obtain some of their bean seeds we call them landraces. They come from species and have been domesticated by growouts, selection, human values and attitudes. Landraces are cultivated wild species. When we take cultivated varieties of interbreeding plants like kales, peppers, corns which have been grown and selected for a long time into cultivated lines and remix them by growing, flowering and seeding them together, they intercross. This primary genetic mix has a diverse population of hybrid intercrosses depending on the number and fertility of the initial cultivars. If one saves the seeds from the mixed intercrosses, plants them again and saves the seeds again, one can continue the process for many cycles. The first generation of the crosses is the G1, Generation 1. Then the next cycle and its generation of crosses is G2. With each generation it gets more complex. G1 plants crossing to G4 plants crossing to G3 plants crossing to G2 plants, for example. After many years usually one can open up the genome pool and increase genetic diversity. The original parents and all the generations of their progeny, taken together, is also a grex. In many ways humanity is also a grex. In terms of vegetables and popular flowers, grexes are intentional. After having grown and selected vegetables and flowers for several hundred years into discrete, recognizable, homozygous lines ie cultivars or cultivated varieties, humanity has begun to remix them. It seems that landraces precede most grexes. Good grexes require wide crosses and an abundant mixture of parents reflecting genetic diversity in visible and invisible traits. Landraces came from times when there were fewer genetic mixes since the species that gave rise to them were widely distributed. Right now one can obtain much more genetic diversity than was possible before Columbus, before computers, before being able to easily travel the world and collect seeds and plants. Now we have huge populations of people growing gardens. At the same time we have industrial and corporate monoculture agriculture. Now genetics and molecular biology have changed our understanding of informational macromolecules, inheritance and genomes. Grexes are a way we solve the issue of how to adapt our foodplants to our local ecosystems and to the exigencies of radical climate change. Landraces have some aspects in common with grexes. They are not the same thing. They have very different meanings and relationships. While the term ‘grex’ comes from the latin for ‘flock’ as Margaret Roach so wisely points out and that it was first applied to the lady slipper orchid Paphiopedilum delenatii and its interspecies crosses, a ‘flock’ of birds encompasses the complexity of generation after generation after generation of breeding, all flying in the sky at the same time. Some years ago, Peace Seeds applied the orchid term for ‘grex’ in a broader way (3 Root Grex Beets, 6 Root Grex Turnips) for what is possible in making multiparent, multihybrid crosses and the complex genomic diversity that arises from them. We need more terms for the mating systems that are seasonal like annual vegetables and for perennials that have overlapping mating that can go on for hundreds of years ie old trees, long lived birds, multigenerational insects and comparable kinds of genomic interactions. Peace Seeds Lists PeaceSeedsLive.blogspot.com, PeaceSeedlingsSeeds.blogspot.com, Andean Crops: Yacon, Oca, Mashua, Mauka; Eco-sanity, Recreality, Biodiversity, Public Domain Plant Breeding, organic kinship gardening, seed growing and collecting, propagation of PNW native plant species esp Lomatiums; propagating the rare and disappearing, to adapt and encourage adaptation of food and other plants to the conditions of extreme weather; grexes with mixed genetic populations of hybridity. Continuing to work with sunflowers, marigolds, tomatoes, andean roots, thanks for seeds of mechamik, the large rooted, hardy, perennial sweet potato Ipomoea pandurata....and during the past few years exploration of wild tomato species and their progeny with heirloom and modern cultivars has given rise to new hypertress tomato plant architecture, From the work of Peace Seedlings with zinnias we are selecting Crown Tiger's Eye Zinnias, a remarkable floristic development. The Ecosanity of Organic Gardening Spring: 2006, modified 2012 by Alan M. Kapuler Ph.D. There is good reason for optimism after a very wet and sometimes cold winter. Spring comes giving rise to spreens, a hybrid word coined by Lindsay Bradshaw that comes from new green growths of spring. It is reassurance that the light is increasing, that night is waning and another cycle in the perennial phenomenon of temperate zone life is miraculously coming true before our eyes. Leaves, flowers, fruits, seeds, food, fiber, sustainability, fertility, society, civilization, a planetary consciousness aware of the interrelatedness of all continues to emerge from the growth of myriad millions of species. Quadrillions of creatures, from subvisual multi-molecular specks called viruses to the macro creatures like us they inhabit, have developed patterns of persistence, endurance and adaptability coming from uncharted interactions, some cooperative, some competitive, all with consequences in the lives, fates and histories of organisms. It is with organisms in mind that brings organic soil into focus. During the recent years, molecular biologists have been exploring the microscopic biology of the oceans, soils, swamps, bogs, fumaroles, fissures and other niches where bacteria and their kin live. We now know that the green in the leaves of plants, the mitochondrial energy systems of our human animal cells, parts of the structure of the chromosomes and membranes of all eukaryotic (means ‘true nuclei’ cells (i.e. not bacterial) come from the two major groups of bacterial organisms that live here on and in this planet. These two major groups, the eubacteria and the archaea pooled their talents and most of what we humans generally call life is the result. Not a shallow consequence for the results of working together cooperatively. In spite of comets, earthquakes, continental plate shifts, changes in the sun and neighboring planets, life has been sustainable for several billion years on this remarkable, uncommon, small, rather inconspicuous planet. On the thin skin of this planet is a biofilm of life. It is not the only biofilm made of organisms, there are others further inside the planet, inside our large intestine and over our teeth and in the soil we organic gardeners and farmers use to grow food, fiber, flowers, and a future worthwhile to everyone. So spring comes and the biosomes (groups of cooperating organisms that give rise to fertility) move into vigor. The nitrogen in the air, the phosphate, calcium, iron and other minerals from the earth, the sunlight striking the green biopigments splitting water into hydrogenium (a hydride minus an electron) and oxygen, each and every part requiring a different enzyme system, a different set of genes located in different sets of microbial organisms. This is teamwork on the cellular, microscopic level. Biochemical free radicals, a diversity of kinds, are moved into, around and through cells to make energy. The discovery and nature of microbial talents continue to be unsuspected, remarkable and profound. Recent discoveries looking at bacteria (microbes or molecular critters = crits) in the open saline oceans finds new crits with molecular talents. Some are diazotrophs, they fix nitrogen from the air. Some are phototrophs, they split water with sunlight, some are phosphate scavengers, others live and use a variety of energy systems based on particular and local ecologies. In the soil, growing plants have the same issues about cooperators, growth enhancing and promoting organisms that inhabit the root zones of plants. Some of these are bacteria, others are fungi. Mycorhizal fungi are intimate with the roots of many plants. There are genetic signals between certain groups of bacteria, fungi and the roots of plants. These are built into the DNA, into the genes, with high specificity. Plants and fungi have genes in common for interacting with certain specific bacteria. Animals including insects and plants have genes in common for preventing the growth of fungi. Organisms that develop the prairies, the forests, the oceans are part of biosomes, the collectives of organisms and their interactions that are the core of how life has thrived on this planet. So as we engage once again the gardening season, the next cycle, consider the weeds as first and second favorite allies in making your garden more fertile, healthier and more productive this year. They go together with the bacteria and fungi. The weeds mixed with soil make food for the bacteria who grow most quickly and provide food for fungi which inhabit the roots making domains for biosomes. The floods have covered garlic and brassicas for weeks now. They seem to survive seasonal flooding quite well. Red Russian kale and Savoy kale are doing very well; the Romanesco broccoli and Openapa chinese cabbage are more ragged. Walking to the edge of the lake that will once again become the center of our vegetable gardening, I wonder at how the biosomes change when there is flooding and oxygen in the soil is drastically reduced. Nine years ago was the last flood and the underground rodents were chased to higher ground and we had great root crops for 3 years before they began to reinhabit the lowlands. So planting layouts are adapted to the seasonal ecology. Yacon, oca, garlic, potatoes, parsnips, carrots, beets, apios, burdock and turnips all go in the now flooded land. Flood brings other consequences. River water used to dilute pollutants from pulp and paper mills, computer chip industries, chemically managed agriculture wash over soil managed organically for decades, a microscopic biofilm coating with a flavoring of efflux from plastics, cars, petroleum products, field animals, and the residue of burned fields and roasted coffee beans. And then there are the weed seeds that get a ride into our garden to be discovered during the cycle where lettuces have to be free of wild lettuce, where free ranging rapeseed (aka canola seed) floats, unsuspected and possibly GMO, into our work of breeding for the public domain and the organic movement while preserving the heritage of temperate zone food crops adapted to our bioregion. Most of the soils I’ve worked with during the past decades of organic seed growing have been impoverished in one way or another. Hence I’ve routinely supplemented the soil with ‘amendments’. In the beginning, these were animal manures, some composted, some not. These gave way to powders of seaweeds, ground rocks and pellets of recycled fish. We made compost and used it for potting soil but rarely had enough for acres of field crops. Several times during the past few years, I noticed that a handful of fertilizer under the transplants attracts slugs and snails who eat the plants after delighting in the amendment. Then I transplanted tomatoes into tilled, unamended soil, and topdressed 1/5th of the plants. The fertilized amendment had no effect. So after 16 years working the same ground, tilling in the weeds religiously, feeding the biosomes, some if not most of the plants we grow don’t need amendments. I wonder how the organic movement got trapped into a supplement dependant analog of chemical agriculture. One of the principal ideas of organics, in addition to local, adaptive and sustainable, is microorganism-allied supplement-free agriculture. The weeds provide the food of fertility and maybe we need some seaweeds for trace minerals and the right magic dust of bacterial inoculants for biosomal crits. In 2005, Monsanto purchased Semenis Seeds, itself the merger of several major seed companies including Petoseeds (USA) and Sluis and Groot (Holland). Thus seed companies who routinely supply the organic movement, sometimes even with ‘organic’ seeds, get their goods from subsets of a company that supplies napalm, toxic agricultural poisons and transgenic canola, soybeans and cotton. An alternative to corporate agriculture and international food commodity marketing is at home organic gardening. An alternative to expensive organic food is to develop personal, family and community gardens with shared costs, talents and services. An alternative to being out of shape is to garden, using tools skillfully and motors rarely if at all. An alternative to being bored and in need of entertainment is to complete the cycles between ourselves, our foodplants and their seeds. Exploring the genome pool of the diversity of life gives some perspective on the extinction of species and the loss of habitats. Looking into the kinship relationship of foodplants to their wild relatives can lead to gardens in which the tree of life is the primary focus. Collecting species in a genus, for example Viola (the genus of violets whose center of diversity is the Andes in South America) or growing varieties in a species (tomatoes, mostly Solanum lycopersicum) and organizing gardens to explore their relationships are two of myriad possibilities for gardening the gene pool and conserving local and locally rare species and varieties. As ‘development’ eliminates both the impressive and the obscure, as ancient and giant oaks and maples become monoculturistic housing projects and camas hyacinths, native to the pacific northwest for their edible bulbs and their blue flowers also find their numbers down to a trace of their widespread abundance a few hundred years ago, we can reckon that conservation of diversity is up to each of us. Kinship gardening provides a way to optimize diversity while exploring its nature. During the past few gardening seasons we have been particularly pleased by the Centiflor, Amish and Palestinian Ohio tomatoes, the edamame soybeans Hakucho, Hidatsa and Oosodefuri, Nutribud Broccoli, the Andean sunroot Yacon, the Andean tubers Mashua v. pilifera and Oca of which we have now collected a dozen varieties. Best of organic gardening to everyone.